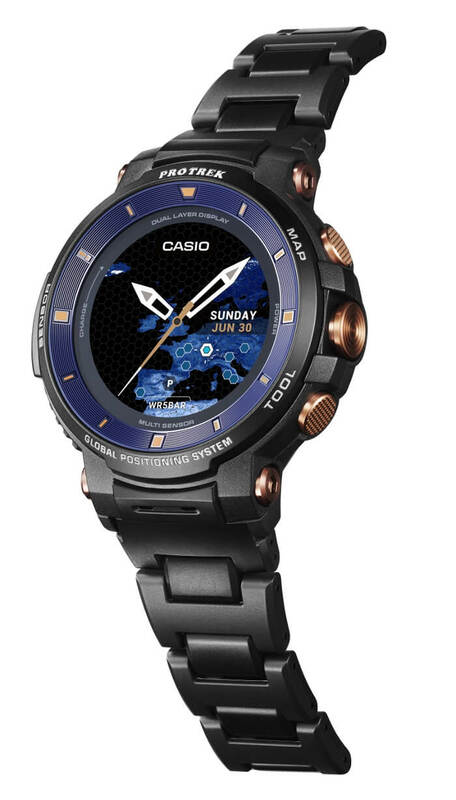 Casio is releasing a special edition of the Pro Trek Smart WSD-F30 smartwatch. 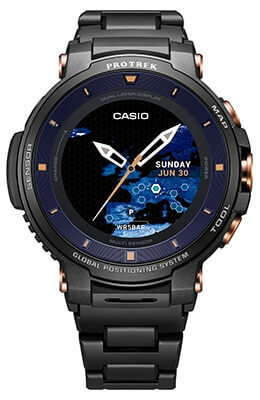 Exclusive features of the WSD-F30SC include a sapphire crystal, field composite band, black and blue bezel with a nano treatment on the inner bezel, and buttons and screws treated with a rose gold ion plating. The sapphire crystal makes the watch more rugged in the way of better scratch resistance. This is also the only WSD-F30 model to come with a field composite band so far. The band has a metallic look but is made of urethane, metal inserts, and fine resin for durability and comfort. 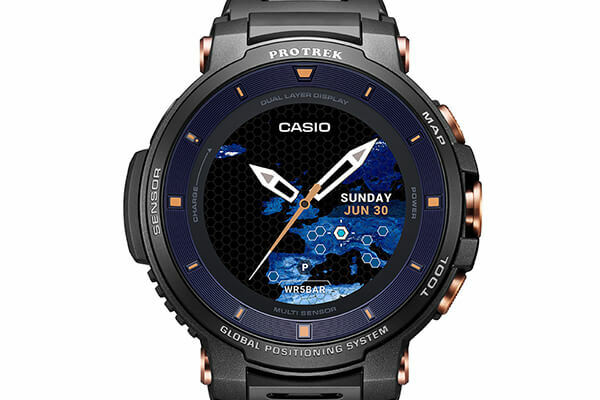 Like the standard WSD-F30 models, the WSD-F30SC is equipped with Extend Mode which allows the watch to run for up to three days on a single charge if using only offline color maps and GPS (up to eight hours per day). The WSD-F30SC has significant improvements over the previous generation WSD-F20 including a smaller size, OLED color display, pressure sensor and compass information on the monochrome display, and advanced power management. The WSD-F30SC is limited to 1,000 units worldwide and will be released in June 2019 with a list price of 100,000 JPY. So far, it has only been announced for Japan and Asia.